So, full disclosure: I wasn’t very happy with Heart of Thorns. I enjoyed vanilla Guild Wars 2, with a few notable exceptions: my main class wasn’t very strong, everyone was on a different server, things of that nature. But Heart of Thorns was pretty pricey for an expansion, and on top of that, if you didn’t do the “Living World” content while it was still fresh and hot, you had to spend money on it in order to progress. That was a crippling blow to my interest as a whole. Overall, I did not have the same fun that I had with the vanilla game. The mastery felt awkward, clunky and unclear, and the maps, while large, felt pretty empty. They were, however, very pretty. That much hasn’t changed. ArenaNet makes sure you're ready to tackle Elona. The idea that Guild Wars’ world of Tyria is a living, breathing, fluctuating world is fantastic. Path of Fire practically came out of nowhere. We had about a month or so to get ready before we began our hunt for Balthazar, the God of War. I know a lot of people who fell off in Heart of Thorns, and they asked if they had to complete it first. That’s one of the big drawbacks to story-driven titles like Final Fantasy XIV, where you cannot do the new content without first doing old content. The good news, for me and others, is that not only do you not have to complete the Heart of Thorns content, you don’t even have to own Heart of Thorns at all! You can just jump right into Path of Fire. It also comes with a level 80 boost, so you can leap directly into the fray with a max-level character. It will come with level 80 gear also, but my stats weren’t all that ideal on my Necromancer. It worked, though. After all, ArenaNet’s dedication to “no level cap increases” means that you can just start right where you want: the new content. Is it worth it to at least own Heart of Thorns? Of course; there are useful things in it that you won’t have access to otherwise. You’ll lack the Revenant class, access to Gliding, and a set of Elite Specializations (one per class). Path of Fire comes with its own set of Elite Specs, so you’ll have two to choose from per class if you have both expansions. They’re basically full classes that operate on a Heroic Mastery system instead of raw exp, but if those don’t appeal to you, and you don’t want to go through all the story (and purchase all the old content you missed out on), you are under no compunction to. However, I do feel like it’s pertinent to note that there aren’t tons of Heroic Mastery points in the Crystal Desert. You can always go back to the old content in Heart of Thorns and Vanilla if you missed them. Like in Path of Fire, each event like this you complete gives 10 points, which is so much faster than the 1 point from the old world content, so it’s certainly something to consider. As you gain these points, you can learn new traits for the class, and equip it to really change/customize how you play. That’s a definite boon in Guild Wars 2’s favor: you have so many ways to play each class. If you get bored with one path, you can try something else! Personally, I prefer the HOT Necro Elite over the PoF one. Guild Wars 2: Path of Fire brings us back to the Crystal Desert from the original Guild Wars, so it’s nice to see this familiar area looking even more gorgeous than before. That’s one thing I can definitely say about Guild Wars 2’s maps: they are absolutely gigantic compared to their predecessors, and the best part of that? They don’t feel empty! There’s so much to see and do, it can be a bit overwhelming. And I know it says “Desert”, but it’s not all brown and sand either. You’ve got ice, snow and so much more. There’s tons of exploration and new biomes to check out. However, some of the Vistas and Heroic Mastery challenges can be incredibly, horribly hard to find, not being able to zoom in very far to the map. Sure, the map will point out if it’s “above” or “below” where you presently are, but that’s not as helpful as you might think. That leads me to the next thought: jumping puzzles are definitely still around. But to make them more challenging, or to make them more interesting, you are now required to use the newly offered Mounts to cross territory and get through some of these puzzles. For that reason, Mounts feel a bit gimmicky to me. I’m glad it’s a new way to approach puzzles and travel, and it will definitely promote going back to zones for completion’s sake. In fact, the only real “Mastery” growth you’ll have in Path of Fire is through your mounts! In addition to the Heroic Trait points, you also receive Mastery Points through challenges on the map, completing the story, achievements, et cetera. When you have a full Exp Bar (bottom of the screen), and the right amount of points, you can train the mount for a new power. This ranges from a higher jump (Springer), longer jumps (Raptor), and more. There are only five mounts in the game as of this moment, and once you complete their four powers, it will offer a passive trait for the others, such as taking less fall damage. The first four are the Raptor, Springer, Skipper, Jackal, and the fifth, once you’ve completed the main story and the “Open Skies” for all the Crystal Desert maps, is the Griffon. Oh and also spend 250g. I do wish you didn’t have to spend currency to unlock mounts that are needed to progress with the story (you can’t progress the story without the Springer, for example). Sure, it’s only 1g and some 50 Trade Contracts (new currency for this expansion), but it’s the principle of it. You can dye the mounts at least, but it’s not a lot of variety. As one of the big traits to add to the game, only having four or five options is a little deflating. But don’t take it to heart! They are fun. They do make the jumping puzzles way more interesting and challenging. Some of the challenge lies in the fact that the physics engine will send you to plummeting back to the start a lot. When you dismount most mounts, it will send you forward a bit, and if it’s a small platform … Whee! Their movement is a bit finicky in puzzle situations, but other than that, they’re very fun. Balthazar's a threat and all, but Legendary creatures won't just kill themselves. So, what’s our big goal here? It’s to do battle with Balthazar, the God of War! Makes sense, right? He’s out in the Crystal Desert somewhere, and we’re going to go hunt him and his minions down, dole out some justice, and save Tyria. So far there are three acts, where you and your guild of NPCs undergo mission after mission. Now, you can complete the entire story in a weekend (or less if you really rush). I did not though because I’ve really found myself exploring the world, trying to get as many Heroic Points, etc. My character was a fresh 80, so I wanted to do it for myself and for my character. The gameplay’s the same though; you help out communities, explore, delve deep into this story, and watch as your team grows and evolves as personalities. That’s one thing that Guild Wars 2 will never lack: Character development. You have a crew of helpful heroes with you to tackle this problem, and they’re all different, unique characters. You’ll probably find yourself slapping your forehead and going “Damnit, Rytlock…” at least a few times. While this is an MMO and you do work with other players frequently in the world, for the story, you have a group of NPCs to help you out. Frankly, it felt pretty easy except the major boss battles. However, I did not die in a single major storyline battle. Anytime I went down, an ally would help me get to my feet and I’d keep right on fighting. From what I’m told, if you do manage to fail, the checkpoints are always close by. There’s plenty of hardship and challenge in the world, though players can look forward to a suitably taxing battle at the end of Act 3. That I can promise. That’s one of the big questions I’ve asked myself while reviewing Path of Fire. For fans of the game, it doesn’t add a ton of new content, but it adds a lot of new stuff to see and do. I feel where it falls short is that it doesn’t add much to draw in a new crowd of fans. 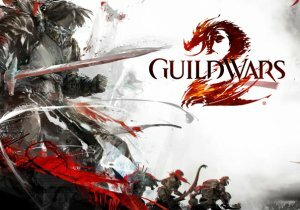 It does appeal to the current fans of Guild Wars 2, but not enough to draw in people who might have never played or have lapsed early into GW2. The story is magnificent, and if they keep it up, it’s only going to get better. The identifying of random gear is pretty awful so far though. Over this weekend I think I identified close to 75-100 pieces of gear, and only two or three were actually equippable by my character. None of them were worth equipping though. I do wish it would have a chance to focus on your current character, rather than just a pile of loot I have no use for. The gameplay is still incredibly solid, and once you hit the end of the story, there’s still so much to do. The world is massive, and you have lots of exploring, missions, achievements and more to unlock. But there’s no end-game, like I said before. This expansion so far has added no new dungeons, fractals, or raids. PVP/WVW is not in yet, but they did say that once it’s prepared, we’ll have it. No sense rushing it, there’s lots of content in the game right now. I can’t really knock it for not having an end-game, because that’s not the model they go with. If you think about it, it’s all end-game. But it does feel a little frustrating for me personally, because that’s what I’m after. That aside, the exploration and journey is really what sells Guild Wars 2. That’s what it’s about, and fans of the franchise know what they’re getting going in. The content is solid, the gameplay is still fun, and the story has frankly never been better. There’s a lot to see and do in Guild Wars 2: Path of Fire for veterans and newcomers alike. End game is always there, a new raid is coming in 3 to 4 weeks and fractals are still there, that is the hard end game. They separated fractals from expacs so that everyone can play new ones when they do add them, which we had 3 new ones last year and reworks to a lot of old ones. New ones are coming pretty soon as well. So endgame content is not, a side from raids, tied into expansions. And I think you only need HoT to access any of the old and I think new raids that are coming. The left the dungeons in favour of fractals and a lot of people like that and a lot don’t since fractals have a hub and not a physical entrance is the most common argument. But I personally preferre fractals, it lets them do story moments that they couldn’t do in the open world due to the lore of them. And is a great tool for all sorts of wacky stories, look at the latest fractal added. All in all a decent review, but in my opinion it deserves a lot more credit. is still the pinnacle for you guys huh. This review is has many things incorrect in it. This is a result of the reviewer misunderstanding the way ArenaNet filters thier content releases. 1) There will never be more dungeons developed. 2) for pvp, wvw, raids and fractal releases. They are released as soon as they are finished instead of waiting for an expansion. That being said, most of these content releases have already been dropped in game a month before Path of Fire and will be dropped more in the coming months.